Wash the watermelon under cool running water and pat dry. On a cutting board, place the watermelon on its side and cut off 1/4”-1/2” from the yellow under side to provide a sturdy base. Roll 1/4 turn to allow you to cut the watermelon in half lengthwise, so you have one half with the sturdy bottom and the top to use for your race car cutout. Hollow out both halves of the watermelon with a spoon or scoop,reserving the watermelon pieces to dice up for serving. Reserve the outer green top half for the racecar cutout. 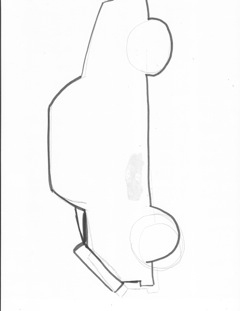 Use dry erase marker on the top half to trace the racecar template. With the knife of your choice, carefully trim away to form the outline of the racecar. Use the Channel knife to form windows and hood or spoiler details. For added detail, carefully pin the wheel playing cards or photocopies for the tires, add stickers to the body of the car with pins or hot glue and affix your favorite number made from a thick slice of watermelon. Use pencil-sized dowels to secure the racecar to the side of the base. 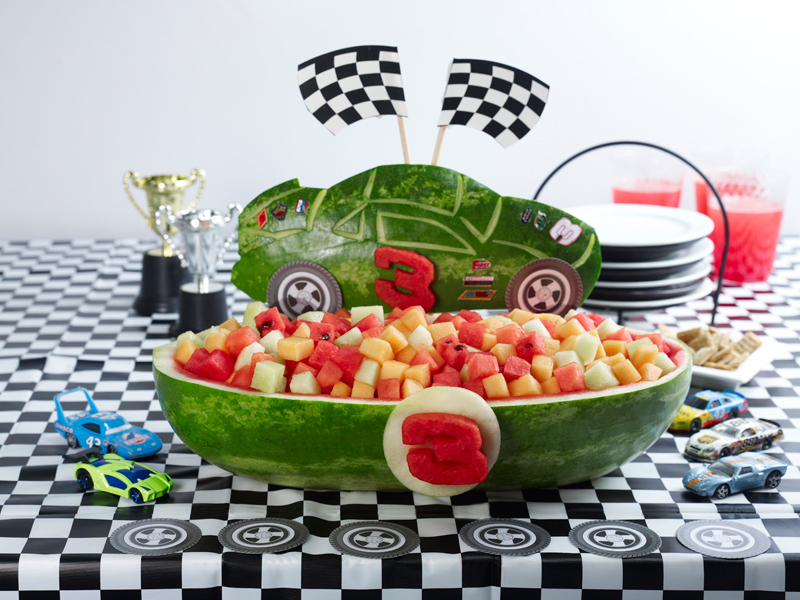 Add racing flags crisscrossed in the back, fill the bowl with watermelon cubes and serve.